My mom just presented me with these vintage forks for my birthday. She filled a bag for $5 at the thrift store. Extra forks make it easy to serve a crowd without using all your grocery budget for plastic stuff. What a nice gift! It's nice to see that your mom is just as thrifty and smart as you are. 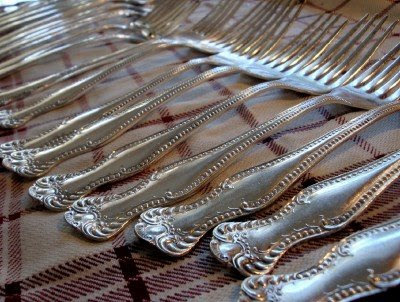 I love the idea of using real silverware versus cheap plastic (and non-biodegradable) ones. Better for the budget and environment! Kuddos to you! I love that you and your mom share the love of thrifting and being careful with money...and that you value the gifts you each find secon-hand. My mom is not a second-hand kind of gal...but I am!!! I really need to get to a thrift store soon. Extra forks would be a God-Send, since we are entertaining from home a lot more now. Happy Birthday, Meredith! Wish that my mom thought that stuff from garage sales and thrift stores was worth giving and receiving! For her, it's all about the money we spend on her, and yet how cheaply she can gift things to us. Sigh....anyway, I think the forks are neat, and will be fun to use next time you host something! I need more forks- thanks for reminding me for my next trip to the thrift store! They are lovely! Happy Birthday to you and what a GREAT idea! Holy Cow! What a wonderful gift that was! I love the style of your forks. We were having a pretty large crowd Christmas Day so I also bought some inexpensive but attractive looking cutlery. It didn't all match - but what I did get looked nice...I know folks like plastic cutlery for the convenience but it doesn't add much effort to the clean up to throw cutlery in the dishwasher or sink. Beautiful! - and happy birthday! Sounds like your mom knows just what you like. Happy Birthday whenever it is and I LOVED that one fork entertaining post you did at BD back in the day! I love that you and your mom are both thrilled with a gift from a thrift store. I wish I could get my family to understand that finding something special with a history that doesn't hurt the Earth will be my favorite kind of gift. Now I know why I like you so much, Meredith! My birthday is tomorrow! Love the forks...a lovely gift, and most practical, too. Gorgeous, Meredith! Enjoy them! I am sure your guests will appreciate how beautiful they are! Your mom is a saint! I would only pray to come across such a great deal such as this! Good find and happy birthday! Pretty forks! I love picking up vintage silver here and there!